If you have been watching The Cruise on ITV then you may be intrigued by the five-star luxury bubble aboard Royal Princess. Here is everything you need to know about that magnificent floating city! Along with a review of my time on board last summer. MS Royal Princess is operated by Princess Cruise Line and she is the third ship to sail under that name. The first Royal Princess set sail in 1984 and was transferred to P&O in 2005. It now sails as the MV Artania. The second Royal Princess was not intended for Princess Cruise Lines but it was transferred to them in 2007. After four years serving Princess, it was transferred to their sister company P&O in 2011 and it now sails under the name MV Adonia. Since I’m not a P&O fan (that’s a story for later) and I only developed a cruise ship obsession in 2013 – I have only sailed on the third Royal Princess. She is my latest love in a long line of ships! I have already booked this year’s ship and I am looking forward to it. But I can’t help but feel that Royal Princess and her staff have spoiled me just a little. Fun Fact: The horn of Royal Princess plays the Love Boat theme tune. The Royal Princess currently spends her summers traversing the Mediterranean Sea and like many Princess ships in winter she crosses the Atlantic and sails the Caribbean. Which I’m sure when its snowing is something we all long for. I know where I live the weather was miserable all weekend long and I was certainly dreaming of being half a world away. It’s not surprising that experiencing Christmas in the Caribbean is definitely on my dream cruise list. I’m hoping maybe this year will be the year! Civitavecchia, Rome: Civitavecchia is the official cruise port to Rome, the eternal city. However, Rome itself is approximately 70km away. The distance from the airport to the cruise port itself makes for an expensive transfer. Any departure port that requires a 90-minute transfer is far too much effort for me! But Civitavecchia seems to be a popular port of departure for all cruise lines at the moment. So needs must! Naples, Italy: For Pompeii, Sorrento and Capri – The port in Naples is certainly not much to look at. They have a modern cruise terminal but the water is a murky brown and the slums are visible…Providing a stark contrast to the deck of the luxury cruise liner you’re standing on. But it is a convenient port to explore a variety of different destinations. I am quite the history dork but had already visited Pompeii the year before whilst sailing on the Norwegian Epic. In search of a new peace of paradise, I hoped on the hydrofoil to Sorrento. The hydrofoil’s pull up a few feet away from your ship, just further down the dock so it is impossible to get lost finding them. The long queue’s also give away where you purchase your tickets. Ignore those expensive ship excursions the Amalfi coast is perfectly easy to locate on your own. The journey itself takes about an hour – The boat also has a covered deck and an open one. So you can either stay in the shade or bask in the Italian sun. I chose to bask…I got sunburn through my t-shirt! Pretty impressive I know. You arrive in Sorrento to stunning cliff views it is only when you have been marvelling at them for a few minutes; that its dawns on you that you’re going to have to climb that…Then again maybe that was just our family, we’re hopeless at doing research and my Dad gets us lost in every port we visit. Needless to say, I trekked up that cliff only to find out a few hours later that there was a lift! So I’m here to spare everyone else. The lift is sign posted alongside the beach and costs two euro for a return ticket. If you want to know about the culture to be found in Sorrento then I’m sorry to say I can’t help you! I didn’t seek any culture, I know, I know, shame on me. But when in sun-drenched Italian cities I prefer to wander around eating gelato. It seems a shame to waste that kind of weather on stuffy museums. But I can tell you that Sorrento has: delicious Gelato, beautiful winding streets, breath-taking churches, stunning cliff top sea views that made up for my aching legs and bizarrely lemons as big as my head. I also thought the floating docks pictured below were pretty cool. Sorrento has limited beach space so the docks provide a home for wee wooden beach huts and sun loungers. They can be rented locally at reasonable prices. At sea: Secretly, sea days are actually my one true love. There is something so peaceful about being surrounded by water. I love the sun even though it hates me and on a sea days you can generally find me by the pool. If there is a good movie on then I will grab a lounger by the main pool. But generally, I can be found out of the way by the Sanctuary pool with my head buried in a book. That is my happy place. Heraklion, Greece: I had visited Heraklion before. Not that I remembered much of it, the last time we were there I was nine. The cruise port in Heraklion is an industrial cruise port and because of this, the port authority provides buses to the cruise terminal. When you set foot outside the cruise terminal you find they have found a solution for those of us who are constantly lost! There is a bright yellow line painted on the floor that guides you to the centre. It is quite literally a case of follow the yellow brick road! The walk itself takes about 15 minutes; depositing you next to the gorgeous marina, which sits at the foot of a vibrant city full of wonderful places to both shop and eat. Kusadasi, Turkey: Since we knew we were calling at this port twice we elected to go to Ephesus the second time around. The first time we just explored the ‘genuine’ fakes…Since we had visited two different parts of Turkey when I was younger we knew that their fakes can be pretty impressive. But bargaining is definitely key! If you want to get yourself some good deals. Gone are the days when you could pick up anything for £5. I know a lot of people are scared of going to Turkey at the moment but I can honestly say I didn’t feel threatened at any point. Although many a man did offer to buy me! The highest offer my Dad got was: two shops, a house and five camels. Istanbul, Turkey: There was some debate on our ship whether we would pull into this port as they had been bombed less than 24 hours prior. But the Captain deemed it safe and in we went! As previously admitted my family is not very cultured and as such, we didn’t have any interest in getting off in Istanbul. Since there was so few sea days on this cruise we took the opportunity to head up onto the pool deck and catch some rays. Later that night though one of the crew did inform us that: there is some cute antique shops around the port area. So if you’re like us and you have no desire to venture far then maybe check those out. Mykonos, Greece: I had visited Mykonos previously on the Norwegian Jade but it was October, overcast and distinctly grey. Still, it was a tiny Greek paradise and I was so excited to see it in all its glory; under skies that were as blue as the sea. 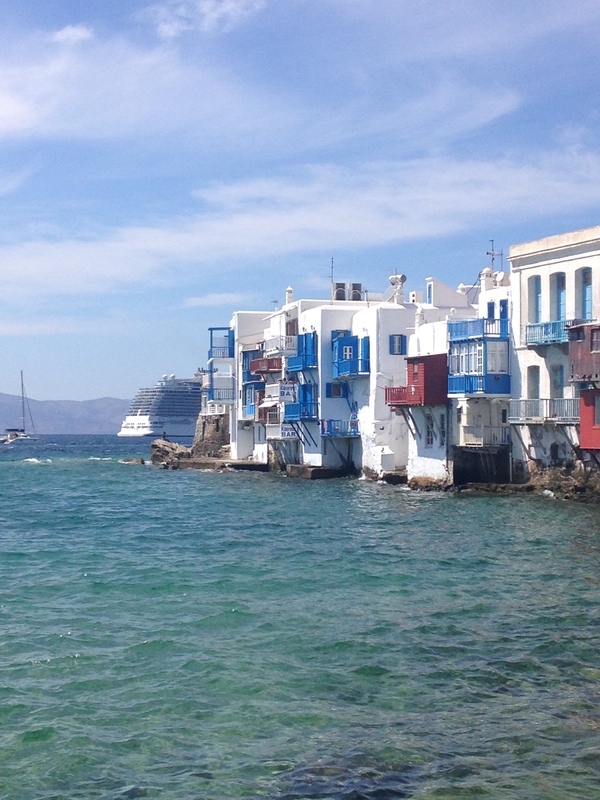 Mykonos only has a tiny cruise dock and when we arrived it was already occupied by a Seaborne ship. Which left us tendering ashore. The process of tendering does take a little longer, after all, there are thousands of passengers to disembark. But the wait is definitely worth it as the tender takes you directly to town, where as, the cruise port itself is a fair distance away. Mykonos is captivating! You find yourself unable to look away from this small piece of Greek beauty. Simply, to explore the island will leave you starry eyed and grinning like the Cheshire cat. The tiny winding streets can be quite the maze but do your best to see every inch of them, I assure you that you will leave your heart on this island. The streets are such a labyrinth that I’m afraid I cannot direct you to the Greek windmills that are often the focus of pictures. We simply stumbled upon them! But I’m sure if you desire to find them google can probably help you out. Also, make sure you drop into Captain’s for a Gyro – They’re my absolute favourite Greek food and this harbour side restaurant provides amazing views and ginormous sharing platters. Athens, Greece: Once again I am an uncultured heathen! And this day was spent on the sun deck far away from the hustle and bustle of the city. I did however take great amusement in watching the staff debate whether we should wait for guests who were late. If you’re wondering we waited about an hour and said guest did eventually come sprinting down the dock! The Captain will not be as quick to leave you behind as you think. Santorini, Greece: Santorini is honestly a little peace of heaven on this earth! When I was there last year stood atop the cliff staring out at the exquisite view. I heard an American ask her partner: If it would ever get better than this? Santorini does that to you, it is so all encompassing, that you truly believe you have found your bliss on that small volcanic island. Surrounded by white washed buildings, blue domed churches and the ever present donkeys. It was my second time on the Island having previously visited it on the Norwegian Jade. But it was just as magical, I could visit every year for the rest of my life and it would still fill my soul with joy. Since we had previously visited the island we knew about the variety of strange options necessary to conquer the cliff. Those being: A cable car, a very steep, slick set of 600 steps or a ride on a donkey. Now the cable car does terrify me but after venturing down the 600 steps last time, I can say NEVER AGAIN. My legs were like jelly by the time we got to the bottom. The steps are not really steps more a series of mini ramps! They’re made up of shells pressed into concrete. This already slick surface is made even more hazardous by the fact that it is covered in donkey poop. Not to mention the occasional obstacle that comes in the form of a stubborn donkey that stands in the middle of the path and REFUSES to move. Long story short, get in that cable car! All the wiser from our first visit we rode the cable car both ways. Though we did take our lives into our own hands another way! We caught the bus to Oia. Now it’s easy enough to find and catch the bus. The scary part is winding around a cliff top on a road that has no barriers. Now my Dad and I were fascinated by the view of the dramatic drop towards the ocean. But everyone else with us was rather more petrified by the potential for plummeting to our deaths. Oia was worth it though! Kusadasi, Turkey: This time we visited The House of the Virgin Mary and Ephesus. We have cruised long enough to know to do our excursions independently and as such this adventure to see ancient civilisation was not affiliated with the cruise line. We ventured off the dock and a little way into town we knew taxi’s would be cheaper there; as the taxi’s parked on the dock have to pay a fee to be there. We met a very kind taxi driver who not only took us to the sites we desire and waited for us. He also stopped at scenic view points so we could hop out and take pictures. If you’re going to do these sights independently like we did make sure you have some Turkish Lira and make sure to wear sensible shoes! (I never thought I’d hear myself say that…) But seriously, if Ephesus was here it would be roped off for health and safety. You certainly wouldn’t be able to scramble up a crumbling amphitheatre. Mykonos, Greece: We berthed in the actual cruise port this time and having already explored the island once we decided not to get off again. Some people may deem this insane. But I say its important to spend some good quality time with your ship. Plus its gloriously empty when everyone gets off. Almost as if you’re aboard a private mega yacht. At Sea: By this point, I was trying desperately to fill in my rather dodgy suntan. I always tan like a zebra! In a rather striped fashion. Needless to say, I failed, my legs were the most hilarious part…Everything was tanned except for my shins which were absolutely lily-white. Naples, Italy: This port day was originally meant to be Valletta, Malta. But as we sailed toward Malta the day before the Captain announced that we would not be able to proceed due to adverse weather conditions. Malta was a very important port during World War Two due to its narrow opening. But it was this narrow opening that was now preventing us from entering. With a strong Sirocco wind blowing the Captain feared we would hit the harbour wall. We diverted to the nearest port with a free berth which happened to be Naples. I didn’t get off the second time we docked. But it has been reported to me that a) they drive like maniacs and b) my Dad got everyone lost and took them all through a fish market…His bad navigational skills take us to such nice places. Palermo, Sicily: We were only in this port for half a day. I regret to say I completely understand the reason for the short stay…As far as I could see this port did not have much to offer! And I think most of the guests got back on the ship pretty sharpish. Civitavecchia, Rome: Disembarkation day…After two weeks in the five-star luxury bubble, it was regretfully time to get off. My pet lip was so prominent that I could have tripped over it. Truthfully, I could spend eternity on a cruise ship and it would not be enough. Was Royal Princess truly up to the Royal standard? Cleanliness: Every Princess ship I have ever been on has been pristine and Royal Princess continued on that legacy. She was immaculate! In fact, we even saw one of the head housekeeping staff looking for dust with a flashlight…Now that is dedication to perfection! Food: Oh my God food! Cruise ship food is actually to DIE for! Since I’m a Princess regular, I have favourite foods that I literally wait for all year long. Royal Princess did fail to provide me with one of those. But since the replacement she offered was pretty amazing, I guess I will forgive her. Baked Alaska – Served on the last night! This is a Princess tradition that you either find out about by accident or know about from experience. On the last night your wait staff hold the parade of baked Alaska’s through the dining room. They light them with candles, turn all the lights out and all the guests wave their napkins in the air. It’s a pretty good time. Make sure to ask your Maitre d’ what time this will be as they only do it once! The international café: This is the place on a Princess ship where you can find food 24 hours a day. As the name suggests like a café it serves a selection of sweet and savoury foods. Most of the savoury foods are not for me because an alarming amount of them contain mayonnaise. But multiple cakes are eaten a day! Its also a great place to grab a pastry or a breakfast sandwich (much like a McDonalds egg mcmuffin) if you want something quick and easy before heading ashore. Prego Pizzeria: Princess have an award for the best pizza at sea! Head up to the pool deck for a giant slice and you will soon understand why. Gelato: On older Princess ships I have sailed on I have loved the ice cream shakes served poolside. Royal Princess did not have those but it did have Gelato! This sit down ice-cream parlour in the atrium served delicious sundaes. Plus a brilliant perk is that if you have the alcohol package they are 100% free. Also a less known fact is that they serve crepes on sea days. Pub Lunch: This was only served once in my two week voyage as opposed to other cruises where I have seen it happen on 3/4 days. But regardless I was very excited to see this familiar princess favourite make an appearance. On selected days British pub lunch will be served, usually in the Wheelhouse Bar with NO cover charge. Entertainment: I’m afraid this is where Royal Princess really fell down! I have sailed on ships that vary in age from 13 years old to 3 years old and have found that as a general rule: The younger the ship the worse the entertainment. The ship is new and shiny and fresh out of the shipyard and because of that they feel they don’t have to try. Guest entertainers: Considering I only remember one of them, a ventriloquist who was rather funny, its probably fair to say that the rest were a disappointment. Deck party: Despite the deck party shown on ITV I can assure you that there wasn’t one on my voyage! I was on Royal Princess for two weeks and there was no deck party. Which is odd because I have had them on other Princess ships I’ve sailed on. Movies under the stars: I love movies under the stars but the movie selection on this voyage really was not too my taste. I did enjoy watching Eddie the Eagle as we sailed out of Naples. However it was not the magical experience I had come to expect…The pool wasn’t covered (netted) as it had been on previous ships and because of this kids were jumping in and out and screaming over the movie. Not to mention the cookies and milk service was nowhere to be seen. Production shows: I felt that the production cast weren’t really given a chance to shine! There were approximately 4 Princess productions in two weeks and none of them were the shows advertised. Piazza entertainment: A string quartet…really? I’m aware I’m not your target demographic Princess but still…Does anyone really want to hear a rendition of the Titanic when they’re AT SEA! The Flair Show: The cocktail flair show by the bar staff of the sea walk bar was brilliant! A fun piece of poolside entertainment that everyone could enjoy. The Vista Lounge (known as Fusion on older ships) was sorely neglected and spent most nights empty! Perhaps it was the lack of bar or maybe it was the lack of bar service when acts were performing. But it seemed such a shame to see it go to waste when it is always so full of life on other ships. The other flaw in this particular design of ship (and the cruise staff agreed with me) is Princess Live. In theory it is a good idea but in practice it has no atmosphere. The Cruise Director had such an impact that I don’t even remember his name…I think I saw him twice in two weeks. Both times he reminded me of a used cars sales man. Both times I remember feeling very annoyed with him for acting the big I am. His poor Cruise Staff would run themselves ragged and he would swan in at the last minute and take all the credit. On the note of the Cruise Staff though they were the saving grace of the entertainment! If you have sailed Princess before then you will be pretty used to certain game shows cropping up in the Princess Patter along with A LOT of trivia (which I never ever win) Most of these were ran by Matt. I feel very bad at this moment that I don’t know Matt’s last name. But if you have ever sailed with Matt, 33 (or 34 if he’s already had his birthday) then you will know who I mean. I have sailed with Matt for two consecutive years now and I quite firmly believe that he is destined to be a Cruise Director one day. When I was on board he was interviewing for ITV’s The Cruise and I’m so sad they didn’t pick him as a key character. He so deserved it! He held the entertainment on the Royal together. There were a lot of lovely waiting staff particularly in the atrium! Where Artana always had a smile ready for us. And in Crooners and later in Princess Live Café where Ryan our favourite member of the bar staff always made sure we were well looked after. The staff truly make your experience on the ship. Remember if you’re kind to them then they will be kind to you in return. Would I sail on Royal Princess Again? In a heartbeat! She is a stunning ship filled with wonderful staff. Not to mention that I miss that itinerary pretty much everyday of my life. It is drab and grey here and I so desperately wish I was exploring far flung destinations. Nearly 4,000 words later I can’t imagine I have missed any information out! But if you have any questions about this luxurious ship then feel free to ask. My question to you is: What is your dream cruise destination? Thank you for taking the time to read!! Lovely ship but I agree on the entertainment.. certainly not for the younger cruisers. Beatles songs by the string quartet in piazza was as lively as it ever got during our week. The nightclub Club6 was usually empty and made me miss nights onboard RC and even Celebrity! Curious to know what your P&O story is..
Venice is my fave port for embarkation/disembarking… such quick access like Barcelona. I am aware Princess is not for young cruisers and I love them regardless! But certainly other ships of theirs have served me better entertainment wise. I will tell the P&O story some day but it can basically be summed up in 4 words: The.cruise.from. Helll.